The best thing about this screen shot is that it took me about 3 seconds to grasp where everthing was and feel comfortable at what I was looking at. I can ask for nothing more in the next Domino Designer. This is just about the best imaginable screen shot I have seen in a long time! The prospect of being able to code "natively" in Eclipse is just great. Just one question, is the Designer going to be cross platform (specifically Mac OS X) or are the plugins still Windows specific? Either way I am still happy but if it works on OS X as well, wow! Agreed... this is excellent news. Also agree that it would make my day to hear that Designer is available on something other than Windows (especially OS X). Looks great! One thing that caught my eye like everyone else is that it looks consistent with version 7. One thing that I would love to see is DOM of a form, subform, script libraries (classes), etc. I know that there is a object browser but that is just a list and not a drill down approach. Regardless, looks great Maureen! Thanks for the update. This looks great. I'm excited to see where you take this ... the eclipse IDE I hope should provide the opportunity to seriously improve the development environment - like the object browser chad suggested. A LotusScript class browser and custom class object browser is a major goal for sure. Multi-platform will be more possible, but we do have a lot to tackle to get this done, so it won't be the first thing we do. But very good to know that there is serious interest in it - it helps us prioritize what to do when! The best thing about this screenshot is that it appears as though it's going to be "just" another Eclipse plugin. ...& I don't mean that diminuatively. I find it real irritating that lots of companies try and make their App use Eclipse, but insist on a separate installation location and a separate runtime. So if I open Eclipse, and Notes on Linux, I'm using 2 200+MB install folders, two separate copies of Eclipse are loaded into memory, etc. etc. I am salivating at the possibility of a Linux only environment. I think in the lift at DNUG I offered to kiss your feet if this happened. Whilst I may take a rain check on this particular part of the offer, the enthusiasm stands. Very very cool. I'm trying to figure out when Bill had time to put that comment in as I've been dragging him around all day, lol. For more confirmation of interest, I am anxiously awaiting this as it is the ONLY thing that is keeping me on an XP box right now. As soon as I can run Designer from MAC natively, I'm gone. Looks great. Fantastic actually. Of course, now we'll be asking for more widgets and better rendering in native Notes. I hope the Notes team is looking at how you're doing the integration. It would be cool. This looks really exciting. The familiarity of it all with what I already know, makes migration that much easier. With running the Notes IDE through eclipse, will a developer be able to do more java integration within our apps ? WOW !!! That will be awesome. Another great thing to look forward from Lotus. Will this mean that there will be a real Javea debugger ? it will do far more than just put the existing Domino Designer in Eclipse. The main goal is to integrate the script editors from Eclipse into Domino Designer - to provide a first class editing experience, including class browsers, etc., in a modern, evolving framework. 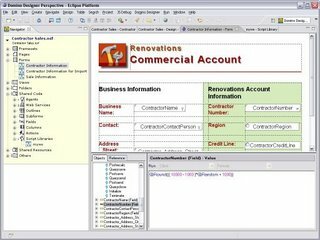 Imagine replacing the Domino Designer script library editor with an Eclipse script editor as the first step! So far I still see the old editor, with all of the warts, primarily the Object browser which didn't really work too well. Can we still expect a more modern script browser? Yes, the script editor replacement is the next step and a major goal of this endeavor, but you're right that it is not yet done. Stay tuned for more, but please understand this is a big undertaking! A Java debugger, yes, in time. More Java integration in Notes? That's a separate issue - we are not trying to change the Notes programming model with this, but rather improve the IDE experience. We're still figuring out the right release points - and it is very possible that it may make sense to release an intermediate form once we have enough done to be helpful. To be clear, though, this is all post-Hannover, it's just big enough that some work needs to start sooner. Hope it is not the old wine in new bottle and enable us to broaden the lotus domino application areas. Probaly moving on to Medium sized application with high volume of transactions. I'm a little confused as to what your comment "To be clear, though, this is all post-Hannover, ..." was related. Tighter Java integration and a build-in Java debugger, or most/all of the Designer in Eclipse stuff?? All of Domino Designer in Eclipse will not ship with Hannover, but rather as soon as possible afterwards. Quick question tho' (and possibly more appropriate for Mary Beth's blog? but I'll post here in any case) - right now standard users of the Notes client can do limited design work - i.e. building simple agents or views/folders - does this relate at all to the work you are doing? I'll fill in the missing blank above :$ - meant to say assuming users can still do this kind of design work in the Hannover client, will that relate to the work you're doing here? Whilst it is undeniably great to see Notes elements in Eclipse, I just hope this doesn't become the same handclapping/backslapping exercise that preceded the last two (disappointing) releases of Designer. Functionality matters more to me than form in an IDE. When I can write custom classes in LotusScript and have Designer aware that they exist, I'll be impressed. When I get Eclipse-like awareness of my variables and custom class methods, and Eclipse like hyperlink navigation, I'll be impressed. I don't mean to be critical - this direction is exciting. But unless the LotusScript IDE functionality jumps forward from 1998, it doesn't matter what the Designer client really is. It looks realy great, but I also think that the new Domino Designer and the Workplace designer will be very similar. And I just wondering, why do need both the new Domino Designer and the Workplace designer. Is there a plan for merge the 2 tools ? More confirmation that MAC OSX support is highly sought after. It is the only thing tethering me to Windows at this time. I agree.. OSX designer... Sign me up!! Is there any timeframe to deliver this exiciting new editor?